It’s been said that the books we read as children help shape us in ways none would expect. In this increasingly technologically age, perhaps like books, the first video games we play as children shape us as well-- or at the very least, they stick with us. While I’m too young to have seen Pong, I am old enough to remember the classic arcade games on Atari and remember the thrill on my older brother’s face when he unwrapped his Christmas present in the 1980’s to discover that Santa had left him Nintendo. My earliest experiences with video games were as being relegated to playing alongside my brother as Luigi (whose more Italian sounding name appealed to me more than Mario) and while I struggled in the wake of faster paced games that we played in the dawn of Sega Genesis, PlayStation and X-Box, I always had a special affection for my earliest games especially Frogger and Ms. Pac Man. Classic arcade games, with their rudimentary graphics and simplistic set-ups to me seemed like the real challenge since not only did the games require logic and skill but as noted in Seth Gordon’s documentary The King of Kong: A Fistful of Quarters, they actually sharpened the minds of players who became better the more they played by increasing their aptitude for logic. As someone who always loathed mathematics, logic seemed like the answer—not only was it the course I relied on to fulfill my mathematics requirement for my first college degree but it also hearkened back to the storyteller in me and one whose experiences not only reading storybooks but trying to get that little frog across the street in all that chaotic traffic made completing the course even richer. Donkey Kong was one of those games—deceptively simple, it’s the type of arcade game that’s gotten even more mythic with each passing year as we’re reminded that the average game lasts only a minute and I can count the number of times I got past the first board on one hand. The first Mario game, in the arcade world, Donkey Kong is the granddaddy of the competitive games and while it always seemed like a logic driven but ultimately fun diversion for my friends and brother growing up, I was completely unprepared by just how ruthless the players of Donkey Kong are in the world of championship video gamers. Yes, you read that correctly—there are actual competitions for people who’ve never gotten past their affinity for arcade games such as Donkey Kong. In the hilariously offbeat yet surprisingly compelling documentary film The King of Kong: A Fistful of Quarters (just released on DVD), we’re given an informative background on a group of gamers brought together in 1982 to be photographed by Life Magazine as champions of their respective games. 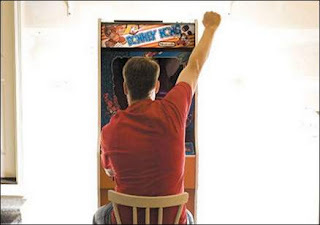 One of these players, Billy Mitchell, who would later be named Gamer of the Century, scored 874,300 points on Donkey Kong and would hold the record for more than two decades until a laid off employee from Boeing dedicated himself to beating the record while he earned his teaching degree in Seattle, Washington. Earning 1,000,000 points, the likable family man and all-around good guy Steve Wiebe sent his tape into the official record holding website Twin Galaxies (headed up by folk singing, transcendental meditating official Walter Day) and while the recognition he received gave him a burst of press and helped restore some of the confidence that had gone with losing his position and having his livelihood threatened, that all changed when Mitchell and his Twin Galaxies cronies sent officials to tear apart Wiebe’s Donkey Kong machine looking for any excuse to void the victory. After the ensuing controversy and a challenge by Mitchell that the only way to have a true victory is to play the game live and set a record in front of everyone at their highly lauded gaming center Fun Spot, Wiebe takes him up on it. He flies out to set a record that’s all the more impressive, given that one of Mitchell’s relentless unsportsmanlike sycophants (who looked and sounded like The Office character Dwight Schrute) remained just out of earshot narrating the events trying to get him to fold under pressure but his victory is short-lived as Mitchell has sent a videotape of him beating both Wiebe and his own former record. Seemingly contradicting his own decision that videotaped records are inadmissible and indeed his fuzzy videotape has some questionable pauses and tracking issues on the left side of the screen making even the most casual viewer wonder if it’s completely legit, the Twin Galaxies crew, determined to keep Mitchell champion puts up his record in less than ten minutes without even a hint of the investigation they’d unleashed on Wiebe back in Washington. “Is this little world too heavily invested in Mitchell as its superstar?” Roger Ebert asked in his pointed review that seemed to echo the sentiment of most viewers who were crying foul. And indeed, it’s at this point, when I think most people who had been treated as poorly as Wiebe by the corrupt, smug tight-knit gamers who seem more gossip prone than a sewing circle would have simply walked away but then again, most of us aren’t as obsessive as gamers and Wiebe gets yet another chance to take the title when the Guinness Book of World Records comes calling and a final event is staged for competitors to be ranked in the book in a playoff that’s held in—and no I’m not making this up—Mitchell’s hometown of Hollywood, Florida. Still, overlooking the proceedings with disdain from his lair, Mitchell compulsively clad in ties with slicked back hair that make him look all the more Machiavellian (as Ebert noted), audiences wait on the edge of their seats to see if he will actually go out to take on Wiebe. “We hate this guy,” Ebert wrote and indeed, we want to know just what makes him tick and why the gamers are so loyal to a fault and the documentary becomes all the more compelling in its stand of Wiebe verses Mitchell that, given the frequent usage of Rocky music and editing that makes it echo the westerns its title seems to connote, manages to entertain and compel viewers to such an extent we feel as though we are witnessing a full scale war rather than a video game competition. One of the most unforgettably engrossing surprises of 2007, Seth Gordon’s The King of Kong is sure to fascinate even those without interest in games or like me, with the inability to survive more than a few minutes of Donkey Kong.